As the world becomes smaller through globalization and the definition of diversity expands to accommodate new dimensions, it becomes increasingly important to identify and measure these changes and interpret how they influence strategic decision-making within organizations. To achieve an organization’s stated goals, it is not only important to recognize this diversity, but also build programs to incorporate the benefits of diversity while minimizing any negative aspects associated with this construct. Sharing case studies of best practices will highlight successes that can be used as models for those organizations that are addressing their training needs in the area of organizational diversity. This chapter will share tools designed to help organizations evaluate their needs in terms of diversity training and development. These resources can help training and development professionals identify needs, design curriculum, create evaluation tools for assessment, and evaluate costs to deploy strategic training and development programs. In today’s corporate world, organizations need to create value and develop innovative practices that will lead to a competitive advantage in the marketplace. To manage effectively, organizations must value diversity and make it an integral part of the organization (Gilbert, Stead, & Ivancevich, 1999). By using diversity management strategies in training and development programs, corporations have the ability to enhance their organizational effectiveness and maximize profits. Cox and Blake (1991) indicated that diversity management can lead to the following competitive advantages for organizations: cost savings, resource acquisition, marketing success, enhanced creativity, and problem-solving and system flexibility. As a result of this paradigm shift, many corporate settings are creating a culture which values and appreciates diversity in the workplace. Organizational benefits for managing cultural diversity to achieve competitive advantage include cost reduction, effective use of recruitment resources, and cultural insight among all employee groups, increased problem-solving capability, and promotion of system flexibility (Gilbert, Stead, & Ivancevich, 1999). The presence of a diverse organization allows a corporation to reach a broader consumer base and market share. When implemented appropriately, training and development initiatives that support diversity management strategies have the potential to dramatically enhance an organizational structure and achieve the objectives of all stakeholders. Another way to interpret how an organization uses human resources to support the organizational objectives is to determine if an HR system is utilized. According to Lepak, Liao, Yunhyang, and Harden (2006), an HR system is comprised of the organization’s HR practices and policies. An example of an HR practice that supports diversity training is making diversity training part of the onboarding process for all new employees as well as refresher courses during the course of employment. The corresponding HR policy that supports that practice would be a policy that requires all new hires to attend training sessions designed to introduce the new employee to the organizational culture, code of conduct, business practices, and commitment to diversity in the workplace. The HR system, comprised of the HR policies and practices that support the strategic goals of the organization, should influence an employee’s knowledge, skills, abilities, motivation and effort, and create opportunities for employees to contribute in a meaningful way to the overall success of the organization (Lepak, et al., 2006). 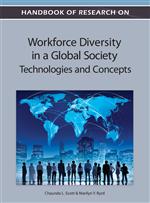 This chapter will address the subject of diversity management strategies as it directly relates to training and development initiatives within the corporate setting. Further, the authors seek to widen the definition of diversity to support the growth of an effective training and development program that utilizes theory, systems, processes, and tools to advance organizational learning and support effective human resource practices. Diversity Advantage: The rare value from a relatively immobile and appropriable diverse work force (Yang, 2005). Diversity Management Strategies: As it directly relates to training and development initiatives within the corporate setting. Further, the authors seek to widen the definition of diversity to support the growth of an effective training and development program that utilizes theory, systems, processes and tools to advance organizational learning and support effective human resource practices. Diversity Management: Is a voluntary organizational program designed to create greater inclusion of all individuals into informal social networks and formal company programs, and is an intentional design to foster appreciation of demographic, ethnic and individual differences (Gilbert, Stead & Ivancevich, 1999). Diversity Process Advantage: The superior problem solving and social integration and communication processes derived from different demographic groups that can help an organization execute operations more quickly, efficiently, and effectively, ultimately outperforming the competition (Yang, 2005). Diversity: Represents much more than age, gender, ethnicity or religious beliefs. Diversity now encompasses various levels of education, experience, technical skills, and learning preferences. These are just a few of the considerations that must be incorporated into effective training and development programs (Kormanik & Rajan, 2010). Diversity Capital Advantage: The organization’s superior composition of different demographics groups that can ensure the organization outperforms its competitors in terms of the availability of a variety of knowledge (Yang, 2005). Training and Development: Is the process of systematically teaching employees to acquire and improve job-related skills and knowledge set by specific learning and performance outcomes (Greenberg, 2011). Organization: Refers to a structured social system consisting of groups and individuals working together to meet objectives (Greenberg, 2011). Diversity Management Program: A specific program that promotes recognition and appreciation of the differences between people and encourages the creation of a supportive work environment (Greenberg, 2011).